FREE first class shipping to any U.S. address. Enter the number on your Gift Card or eGift card. Your Card number is located on the email we sent you. 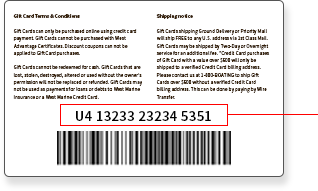 The gift card number can be found on the back of the gift card. 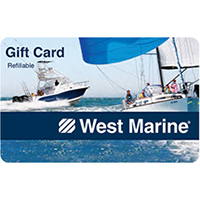 Gift Cards can only be purchased online using a credit card payment and cannot be purchased with West Advantage Rewards Certificates. Discount coupons cannot be applied to Gift Card purchases. Gift Cards cannot be redeemed for cash. Gift Cards that are lost, stolen, destroyed, altered or used without the owner’s permission will not be replaced or refunded. Gift Cards are only valid in the U.S. and Puerto Rico. Gift Cards shipping Ground Delivery or Priority Mail will ship FREE to any U.S. address via 1st Class Mail. Gift Cards may be shipped by Two-Day or Overnight service for an additional fee. *Credit Card purchases of Gift Cards with a value over $500 will only be shipped to a verified credit card billing address. 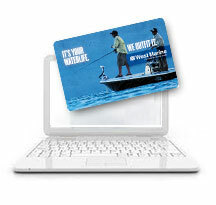 Please contact us at 1-800-BOATING to ship Gift Cards over $500 without a verified credit card billing address. This can be done by paying by wire transfer.